The New York Times, the self-described paragon of journalism, embarrassed itself thoroughly Tuesday when it hired, and hours later fired, a “lead opinion writer” brought on to focus “on the power, culture and consequences of technology” — because the paper failed to adequately investigate her Twitter history. 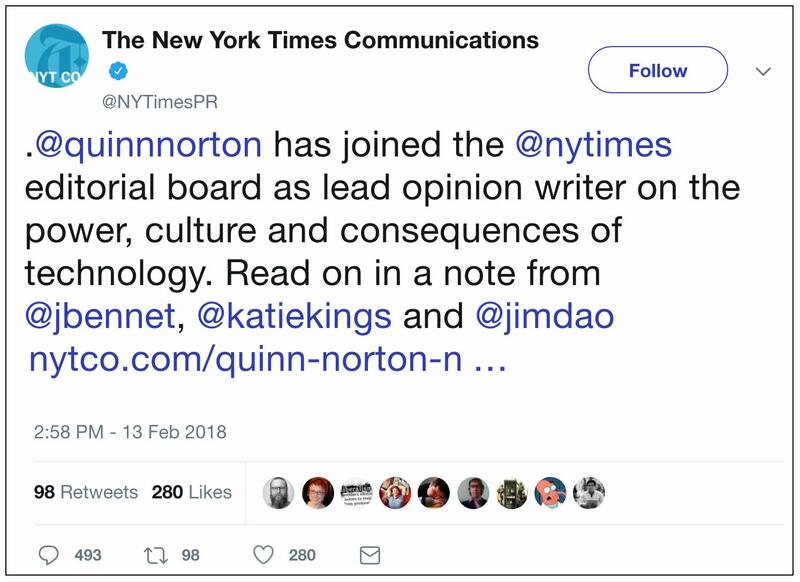 We’re delighted to announce that Quinn Norton has joined The New York Times editorial board as our lead opinion writer on the power, culture and consequences of technology. Quinn is probably best known for her work at Wired, where she reported on Anonymous, the Occupy movement, and hacker culture and wrote regularly for the digital security blog Threat Level. She was also a columnist at Maximum PC magazine for five years, and she’s written regularly for Medium and contributed to The Atlantic, ProPublica and Gizmodo. Quinn’s time as an embedded Occupy activist must have tantalized the editorial board’s dedicated leftists. The paper’s technological “uncertainty” extended to how to vet new employees’ Internet activity. … I’m trading in freelance life and joining a publication full time. I’ll be joining the New York Times editorial board as their technology writer. … As I interviewed with Katie, then James, they made it clear that they weren’t going to get put off by a little weird. As for how weird, well that’s for them to discover. Quinn Norton has tweeted that she’s friends with neo-Nazis, and has used slurs on a regular basis. … Twitter users immediately began pointing to her past tweets, in which she’s admitted she’s “friends with various neo-Nazis” ― though she says she has “never agreed with them.” In other tweets, she’s called users “fag” and used racial slurs. … By 10 p.m., Quinn had been released from the company. Things might have been different if the Times actually had investigative journalists and fact-checkers experienced in investigating individuals’ background, experience, and Internet activity. Apparently, it doesn’t.